Background: HOGGS is a local burger joint here in Moreno Valley, CA. It’s a nice place to hang out with your buddies and have a few brews. They also have a couple of TV’s that usually has the sports games showing. It has that “backyard” feel too. Probably because the wall paper on the main side of the dining room is a picture of the owners backyard. Their burgers are so juicy. Great flavor! Tastes like they just came off the grill. They are a good size; I would say about an inch bigger than an In & Out burger and definitely thicker. You can get this as a double, but I opted for the single (I usually get the double, wink). You can also choose your kind of cheese. The typical choices of provolone, american, cheddar, and pepper jack. The bun is soft and tasty as well. The bun is not flimsy and does not really fall apart while you are eating. I’m not saying it won’t during your last few bites though. That’s usually how a juicy, condiment filled burger ends up doing during that last quarter of your burger. Even thought the burger is delicious all own its own and can be enjoyed as is, but I must say that it is taken to another flavor level when eaten with their BBQ sauce. The sauce: it is a spice BBQ sauce that just goes so well with the burger. They provide it in those big ketchup squeeze bottles (not like Heinz ketchup, but those old school ones that are usually colored yellow and red, but theirs are clear). You just take a bottle with you to your table and squeeze some of the sauce on before every bite. My mouth is actually watering as I’m typing this. As for the spicy-ness, it doesn’t take away from the flavor of the burger and I would say it is not spicier than Tabasco sauce, if not milder. 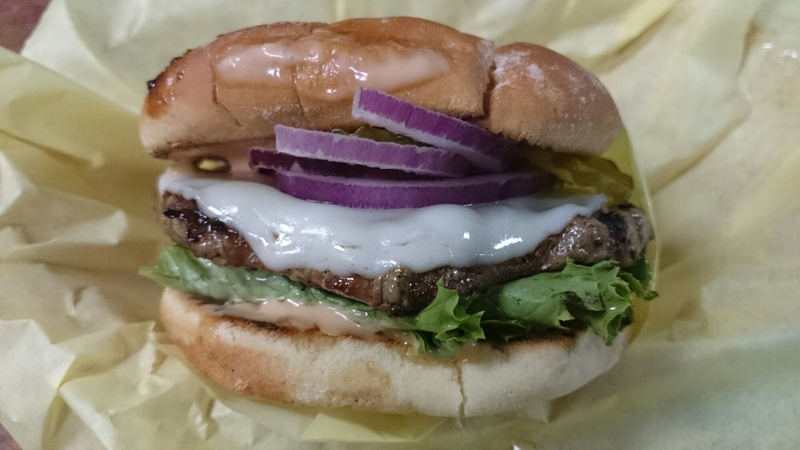 If you’re on your way to Casino Morongo or the Cabazon Outlets, swing by and grab a burger. Delicious!